As part of the #ModiFail campaign, the Alliance for Justice and Accountability (AJA) is using billboards to raise public awareness about Indian Prime Minister Narendra Modi and his administration’s attacks on personal freedoms and human rights in India. 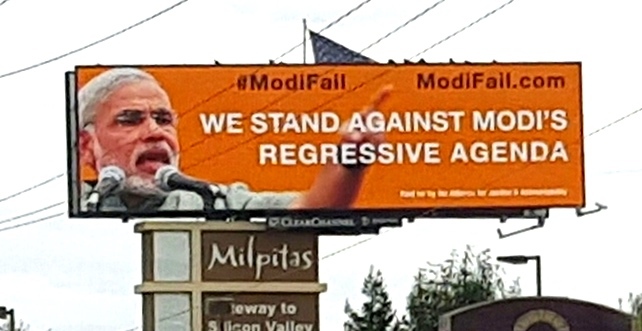 AJA hopes this series of billboards in the San Francisco Bay Area will inform the American people that Modi’s upcoming Silicon Valley PR tour is being used as an excuse to whitewash his dismal record as Prime Minister, and before that, Chief Minister of Gujarat. The billboards are visible from I-580 in Oakland, I-280 in Daly City, Highway 92 in Hayward, Highway 84 in Newark, I-880 in Newark, I-880 in Milpitas, and Highway 101 in Santa Clara. The billboard highlights ModiFail.com, the AJA’s online report card highlighting the facts behind some of Narendra Modi’s most egregious failures during his 16 months in office as Prime Minister. India’s celebrated values of pluralism and tolerance are under severe attack since Mr. Modi assumed office as Prime Minister. According to the Modi government’s sources, attacks against religious minorities are up 25% since last year. His own ministers are engaged in a malicious hate campaign against Christians and Muslims. The Alliance for Justice and Accountability (AJA) is a diverse coalition led by progressive Indian American communities. AJA members work for pluralism, civil rights, religious freedom, women’s rights, LGBTQ equality, and environmental justice in India and beyond.